Pen and brown ink over graphite preparatory drawing, with additions in graphite; on laid paper; 287 x 310, pasted on to folio  of volume and framed with a double ruled border in brown ink. An unfinished proposal for the elevation of the river frontage of the surviving York Water Gate, drawn probably by Nicholas Stone. As built, the gate differs from the design in the configuration of the stonework and height of the central attic. The courses in the walling of the gate were built larger, aligning with those on the columns, while in the central bay the voussoirs were made to rise to the base of the cornice, eliding the architrave and frieze. The attic was built lower and filled with a sculpted cartouche framed by heavy festoons. Scallop shells, like those in the frieze of the design, were added to the end-blocks of the attic, which were built lower than in the design. The lions, however, were carved in positions similar to those in the drawing. They hold Buckingham's shield, the left one topped by a scallop shell and the right one by a mask. On the building the arms are set in a central cartouche and the lions have fouled anchors (anchors with rope wound around them). The anchors refer to the office of Lord Admiral which Buckingham held, as well as to the gate's function as a point of access to the river. Drawn experimentally in pencil within the central opening is a narrower, lower arch containing a square-headed door, surmounted by a plaque. Although probably not constructed, the door confirms that the gate was intended to stand on a platform above the waterline. Complementing the door are panelled shutters drawn in ink in the side bays. It is not clear whether these were ever executed. 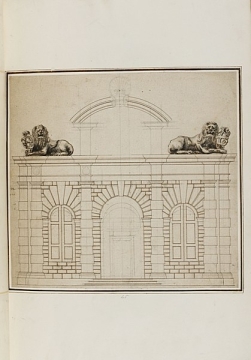 Charles Stoakes, in the list of the works of his great uncle which he inserted at the end of Nicholas Stone's Account Book at Sir John Soane's Museum (Walpole Society, VII, 1918-19, p. 137), mentions: 'The Water gate at Yorke house he designed & built, & the Right hand Lion hee did frontting the Thames, Mr Kearne a Jarman [a German] his brother by marrying his sister did the shee lion' ('Mr Kearne' was the sculptor Andreas Kearne or Karne, fl. 1627-41). A case for Stone's authorship of the drawing can be made from similarities with two designs from Stone's workshop for monuments attributable to him. One is a contract drawing for a monument to Thomas Bodley, c.1614, and the other a design sketch for an unexecuted monument probably intended to commemorate Sir Robert Cotton (d. 1631) (See A. White, 'A Biographical Dictionary of London Tomb Sculptors, c.1560—c.1660', The Walpole Society, vol. LXI (1999), Figs 24 and 23). The former may not be in Stone's hand but the design shares architectural detail with the drawing, notably the narrow bands of stonework with thin fascias at the joints and a segmental pediment with deep crowning mouldings. The other design is titled by Stone and has similar heavy graphite under-drawing. Stone was closely connected with the royal works, having served as Jones's master mason in the building of the Banqueting House, Whitehall, in 1619-22; in 1626 he became 'master mason and architect' to Windsor Castle. The high technical proficiency of the drawing of the lions could be explained by Stone's long training in the workshop of his father-in-law Hendrick de Keyser in Amsterdam. Although in the past the York Water Gate has been attributed to Balthazar Gerbier (1592-1663), this drawing cannot be in his hand. His design for a gateway at Hamstead Marshall House in Berkshire in about 1660 has similar rusticated Tuscan columns to those of the completed York Water Gate, but the drawing is entirely different in technique to the present one. It is executed in brush and wash, with scarcely any pen drawing, and the architectural detail is loosely rendered (Bodleian Library, MS Top. Oxon a.37*; see Colvin, 2008, p. 415; and J. Summerson, Architecture in Britain 1530-1830, pp. 150-51, fig. 105). It is notable that when boasting of his works at York House in 1628 in his Brief Discourse concerning the Three Chief Principles of Magnificent Building (1663), Gerbier did not claim the Water Gate as his own. Inigo Jones probably had a role in revising the design for execution. He had designed gates and a coffered ceiling for the Duke of Buckingham's house at New Hall in 1623 (Harris and Higgott, Inigo Jones: Complete Architectural Drawings, 1989, cat. nos. 42, 43, 49). In his designs for Tuscan gates in the 1620s he favoured large-scale blocks with broad fillet mouldings at the joints, and sought to unify the applied order and walling by continuing the rusticated bands across the columns or pilasters (see Harris and Higgott, cat. nos. 44-47). These characteristics are found in the design. By contrast, Nicholas Stone, in his gateways at the Oxford Botanical garden in the 1630s, favoured playful, discontinuous effects in his treatment of plain and rusticated stonework, by alternating rusticated bands on the columns with those of the walling in a chequerboard effect. On the present design, the bosses on the Tuscan columns are larger than the blocks that make up the walling of the gate and do not align with their courses, creating deliberate contrast between the applied order and the wall. This stylistic trait strongly supports Stone's role in this initial design. Inigo Jones's role appears to have been to recast Stone's design in his own idiom, giving much greater depth to the rusticated courses and unifying the applied order with the walling of the gate. Early topographical views of the York Water Gate and measured drawings of the surviving fabric are reproduced, with a brief discussion, in Survey of London, volume XVIII, The Strand (the parish of St Martin-in-the-Fields, part II) (1937), pp. 54-60 and pls 28-32. N. Pevsner and S. Bradley, The Buildings of England: London 6: Westminster, 2003, pp. 378-79; Colvin, Biographical Dictionary, 2008, p. 991; K. Ottenheym, P. Rosenberg, N. Smiet, Hendrick de Keyser Architectura Moderna, Moderne bouwkunst in Amsterdam 1600-1625 (Amsterdam, 2008), pp. 23, 122 and fig. 19.